“This dates to about 4,000 years ago. What's interesting about this guy is that his atlatl (throwing stick) is backwards and his wrist has a crazy decoration. The more you look, the more you see,” she said. “I won't say if it is better or not because it would be like comparing great painters such as Van Gogh, Rembrandt and Velasquez!” he exclaimed. 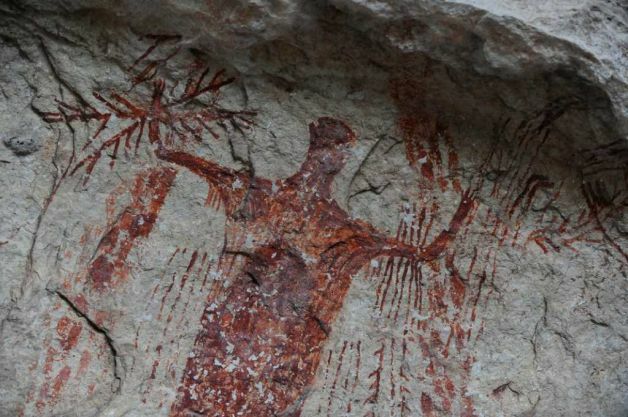 Over the past decade, Boyd has developed plausible theories about the meaning of the elaborate cave drawings. Specifically, she has linked them with the peyote ceremonies of the Huichol Indians of western Mexico. 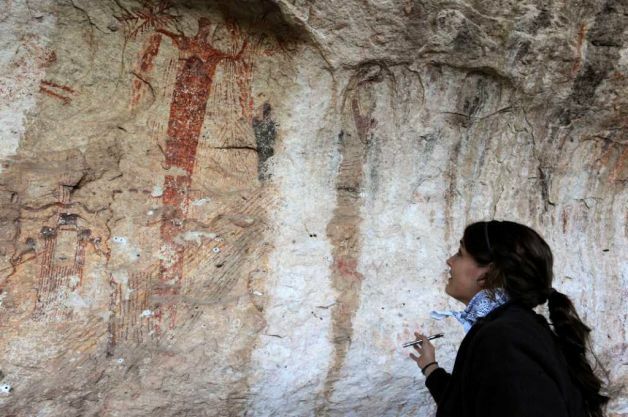 Two years ago, she said, a Huichol shaman came to see the Pecos rock art. “It was fantastic. We walked up to the panel and Matsua just stared at it. Then he started sobbing. He said, ‘They are here. All of my ancestors,'” she recalled. Years earlier, Boyd took reproductions of one of the most important compositions to Real de Catorce, Mexico, where the Huichol come in annual pilgrimage to gather peyote for religious ceremonies. “I took my rendering of the White Shaman panel and showed it to one of them. And he said without prompting, ‘That's our pilgrimage,' and began recognizing different elements of the pilgrimage in the panel,” she said. 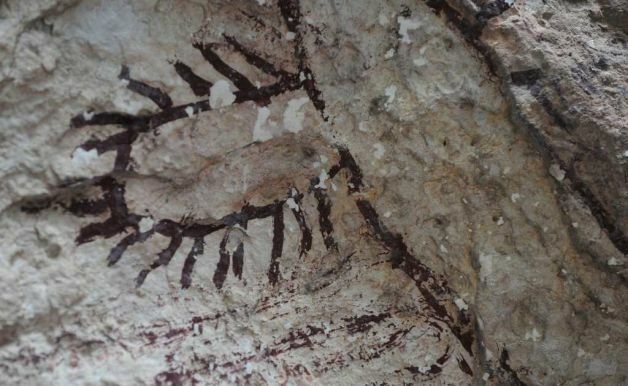 Regardless of its exact meanings, what is abundantly clear is that the Indian rock art, which required great effort and the use of precious resources including fatty deer marrow, was not a leisure-time activity. 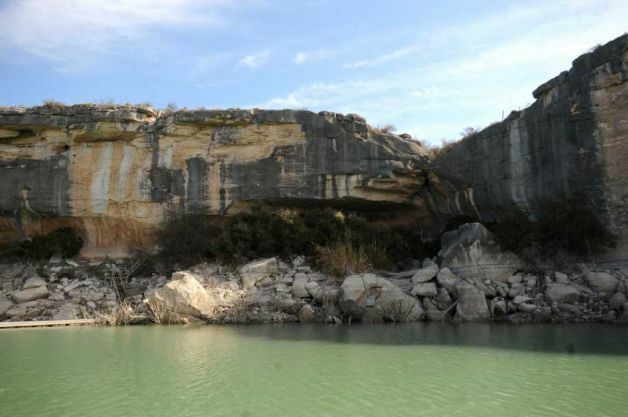 Castañeda, 22, works for the Shumla Archeological Research and Education Center, which since its founding 14 years ago by Boyd and her husband, botanist Phil Dering, has pursued a dual agenda: studying and preserving rock art, as well as providing classes and seminars to children, adults and visiting academics. Amanda Castaneda, a project archaeologist at the SHUMLA School in Comstock, Texas, explains a portion of the Panther Cave mural to Greg Garetz of the National Park Service. It's well-known to the generations of Del Rio kids who have attended the open-air, hands-on classes for public school fourth-graders at Shumla's 70-acre desert campus. “It's one thing to do the heady academic stuff, but if you can't reach out to the public and connect with the children, you've failed your mission,” Boyd said. 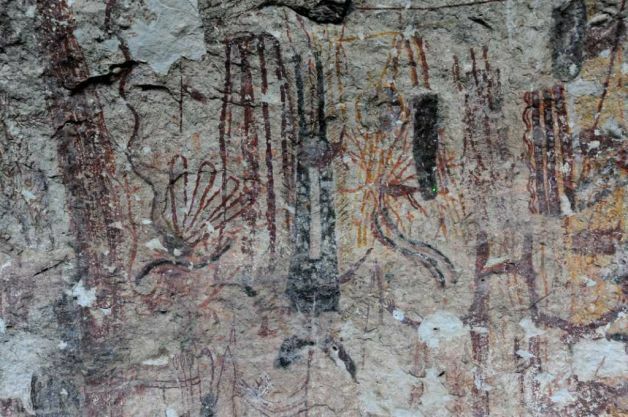 The organization, which operates on grants, is working feverishly to gather information on the cave paintings and other ancient artwork. “I feel like I'm in a race against time,” said Boyd. “If someone walked up to you and handed you the oldest known book in the Western Hemisphere, what would you do? Most people would spare no effort to preserve and protect it,” she added. Beyond taking photographs and making illustrations of each figure and object, researchers are collecting more than 100 pieces of “attribute data” for each one. The urgent need is apparent at Panther Cave, where insects, vandalism, and high humidity from damming the river four decades ago have degraded some images. Others are obscured by ash from long-ago fires and the silt from a monumental deluge. “That's from the 1954 flood, which came before the reservoir was built. If we had a comparable flood now, we're afraid the water would be 60 feet higher,” said Greg Garetz, 61, chief of Resource Management & Interpretation for the National Parks Service.